Edgar Allan Poe was an American writer, editor, and literary critic. He is best known for his poems and short stories, particularly his stories of mystery and murder. Poe is regarded for being one of the most famous authors to come from the Romantic period, he is also considered to be on of America’s first short story writer. Poe is also widely credited in inventing the detective/mystery fiction genre, as well as science fiction. He was on of America’s first authors to make a sole living off of his works, making his financial life very difficult. Poe was born in Boston on January 19th 1809. He was the second child of two actors, his father left in 1810 while his mother passed the following year. Now an orphan, the Allan family took him in. It should be noted that although Poe lived with the Allan’s he was never officially adopted. Poe attended the University of Virginia, however he could not return the following year due to lack of funds. At this time in his life, he was also beginning to quarrel with his adopted father about money. Due to the lack of funds Poe decided to join the army in 1827 under and assumed name. It was also at this time in his life where he would begin his publishing career. With an anonymous name he publish a collections of poems Tamerlane and Other Poems. 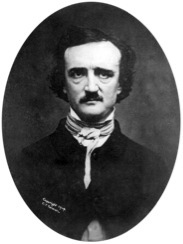 After failing to become an officer’s cadet at West Point, Poe declared his love for poetry and prose. It was at this point in his life when he would truly have the falling out with his adopted father (his adopted mother already dead). After publishing his book of poems and separating from his adopted father, he switched his focus to prose. He spent the next several years working for periodicals, and literary journals becoming well known for his literary criticisms. In 1835 he married his 13-year-old cousin Virginia Clemm, Poe was 26. Ten years after their marriage she died of tuberculosis, two years after Poe published The Raven. He had dreams of publishing his own literary journals however he died before it could be produced. Poe throughout his lifetime published many poems, short stories and novels. However the actual number of how many is widely debated. It is rumored that only 12 copies of his Tamerlane and Other Poems, have survived over the years. Poe died on October 7th 1949, it should be noted that at the time of Poe’s death, Poe himself was delirious, and dressed in another mans clothing. To this day his death is still a mystery. “Edgar Allan Poe.” Wikipedia. Wikimedia Foundation. Web. 5 Nov. 2015. The Open Anthology of Earlier American Literature: A PSU-Based Project by Kendall Panaggio is licensed under a Creative Commons Attribution 4.0 International License, except where otherwise noted.